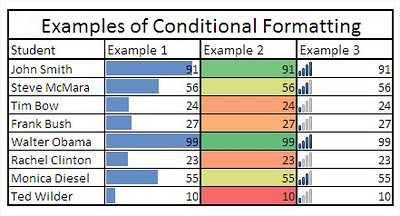 Excel: Using conditional formatting to highlight dates - Something New Everyday! This tutorial on using conditional formatting to highlight dates is brought to us by MVP Frédéric Le Guen, with special acknowledgment and thanks to Ken Puls for assistance with translation from French to English. Date functions in Excel make it is possible to perform date calculations, like addition or subtraction, resulting in automated or semi-automated worksheets. The NOW function, which calculates values based on the current date and time, is a great example of this. Taking this functionality a step further, when you mix date functions with conditional formatting, you can create spreadsheets that display date alerts automatically when a deadline is near or differentiates between types of days, like weekends and weekdays. Home > Conditional Formatting > Highlight Cell Rules > A Date Occuring. These 10 date options generate rules based on the current date. If you need to create rules for other dates (e.g., greater than a month from the current date), you can create your own new rule. Below are step-by-step instructions for a few of my favorite conditional formats for dates. In the next dialog box, select the menu Use a formula to determine which cell to format. The parameter 2 means Saturday = 6 and Sunday = 7. This parameter is very useful to test for weekends. 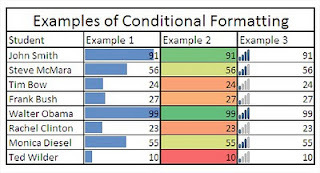 Note: In this case, you must lock the reference of the row so that the conditional format will work correctly in the other cells in this table. Then, customize the format of your condition by clicking on the Format button and you choose a fill color (orange in this example). Select This Worksheet to see the worksheet rules instead of the default selection. In Applies to, change the range that corresponds to your initial selection when creating your rules to extend it to the whole column. Now you will see a different color for the weekends. Note: This example shows the result in the Excel Web App. To enrich the previous workbook, you could also color-code holidays. To do that, you need a column with the holidays you'd like to highlight in your workbook (but not necessarily in the same sheet). In our example, we have US public holidays in column AH (as related to the year in the cell B2). Again, open the menu Conditional Formatting > New Rule. In this case, we use the formula COUNTIF in order to count if the number of public holidays in the current month is greater than 1. Then, in the dialog box Manage Rules, select the range B4:AF11. If you want to highlight the holidays over the weekends, you move the public holiday rule to the top of the list. This example in the Excel Web App below shows the result. Change the value of the month and the year to see how the calendar has a different format. In the Excel Web App below, try changing some dates to experiment with the result. First, go into a new column (column E), calculate the difference in number of days in a year again with the DATEDIF formula and the parameter "yd". The result is a gradient color scale with nuances from white to red through yellow. The closer to 0, the more red it will have, the closer to 10 the more yellow, and the closer to 30 the more white. In the Excel Web App below, try changing some dates to experiment with the result.